New LBSs who do their Mirror-Work grow and change, becoming experienced and detached LBSs with different goals and needs than they had at the beginning. People have been telling me that the forum tone is changing since the early days and I’ve always known this was inevitable; it’s the nature of a growing community with growing members. When I opened the forum in May 2010 most members were less than a year past Bomb Drop, now those original members are 5 – 6 years away from Bomb Drop and many are divorced. The needs of each person change as they go through this journey; we now have a mixture of varying levels of experienced LBSs coexisting alongside raw newbies. Let’s look at who we have in our community now. The concern about the changing tone of the forum is a revolving complaint. Newcomers typically find a refuge in the forums’ support of Standers, but newcomers grow and change and along with their changes, the nature of the advice they receive may change. The Middle-Timers are caught between the attachment, shock and raw pain of a new LBS and the wisdom that comes with more Mirror-Work, time and experience in observing MLC as it progresses. Twelve to 18+ months after arriving at the forum where they felt safe and supported in their Stand, some now feel the forum is moving toward divorce, less acceptance and support of Standing and moving away from the Unconditionals which promote love and forgiveness toward the MLCer to demonizing the MLCer. While these Middle-Timers are feeling confused and frustrated in their Stand and in their place at a forum they feel may no longer support their needs or values, new LBSs are arriving feeling they have found a refuge in the forums’ support of Standers. A great deal of the dissatisfaction may be more about the place in the journey, the place of their peers in the journey and the changing of the advice they may be receiving—due to the changing of the place in their journey. Middle-Timers still fear divorce and yet for many it’s a looming reality that they don’t want to read about or face. They’ve been around long enough to notice the differences in advice they received as Newbies versus now. More of their peers are dropping off the board and those LBSs they looked up to when they arrived have crossed the 3 year mark and are posting differently than they had previously. It can be a disappointing turning point when someone you admire who is ahead of you in the journey stops Standing and files for divorce, or even if they continue Standing but feel they must file for divorce to protect themselves. There is also the problem of expectation. You have learned that expectation in MLC will do you no good, but having an intellectual understanding does not mean you don’t have expectations—even though you may be unaware of them. Since I give an average range of MLC as 3 – 7 years, a lot of you approach the 3-year mark with expectations, watching for a change in behaviors and even adding subtle pressure. If your MLCer does not respond with Touch-N-Goes and Reconnection, you become angry, frustrated and lose hope. You may doubt your Stand or yourself for not doubting your Stand—is something wrong with you? With an ever-steady flow of new LBSs to the forum, MLC seems never-ending. It doesn’t matter that you need to do your Mirror-Work, stop focusing on the alienator, accept the process of MLC, protect yourself financially… if you are not going to do those things—yet. Denial is one of the stages people go through as they process their grief. When you are frustrated by the resistance of a new LBS ask yourself: What part of denial don’t I understand? You all have your own path and for some of you that path is longer; each individual will change at their own pace, coming to a place where they will take action when they are ready, not when anyone else thinks they should be ready. Bomb Drop is the biggest shock and change most of you have ever experienced; denial and resistance are how Newbies protect themselves from this overwhelming situation, giving them time to adjust to the new abnormal. It can take a few years to grasp the concept of what has and is still happening. When helping each other, meet each individual at their level rather than yours. Accept what they are and are not ready to do and hear and guide them forward gently. They will progress, but pressuring may cause resistance and they may first regress into a protective cocoon. Wise-Timers often become frustrated with Newbies because they know the work it takes to get to the next level. With shock behind them, the Wise-Timers have the advantage of not being flooded with adrenal hormones. They may remember the feelings and the pain, but memory is not like present experience; what they may not recall is the lack of control they felt over how they were reacting and they want to help you avoid the pain and mistakes they made. But going through that pain and those experiences is—sorry—part of the journey and you get to the other side through your own toil, not by hitching a ride. Newcomers are often resistant to what the more experienced have to say; this creates some clashes and many experienced LBSs can no longer handle reading the raw pain of the newbie stories because it both brings them back to that place and because they know what it took to get out and are frustrated when met with resistance. Middle-Timers become frustrated with themselves because they feel they should be at the next level—even if their MLCer is not there. They are often resistant to the idea that their journey is not almost over. Even those who came to a place of acceptance of the journey often reach a point of expectation because they had accepted the process of a 3-year journey and now it’s time to collect the reward of reconciliation. 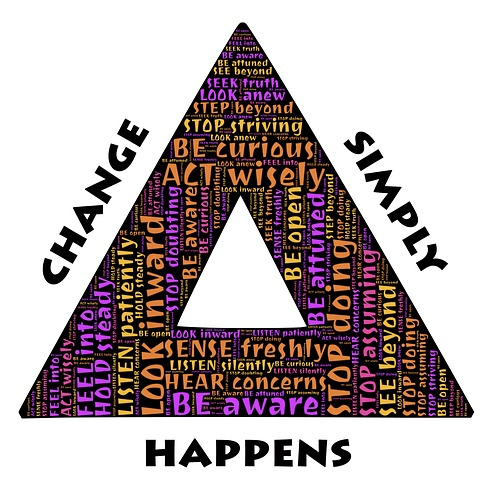 Initially LBSs fear change, after a few years they become frustrated at the slow rate of change. Middle-Timers initially accept the MLC range, but as the low-end approaches their hope begins to soar—especially if they are seeing an increase in Touch-N-Goes and even Reconnection attempts. Their challenge is to forget about the MLC average range. Yes, some Reconnect or are clearly headed toward Reconnection by the 3-year mark, but many more remain entrenched in Replay even with increasing Touch-N-Goes. Peer pressure adds an additional element to their self-doubt. In the beginning it is the outsider—the friends and family who are not in the direct path of an MLCer—who are concerned and often unsupportive of Standing. But after a few years, many LBSs join the Standers are crazy ranks. It may feel as though you are the only one left Standing from your newbie class. This period is when bitterness and resentment threaten to poison LBSs. At some point after 3+ years there is a click like an epiphany and LBSs finally approach the final stage of release: Surrender. Sure LBSs have intellectually understood the need to put the oxygen mask on themselves first, but now there is a change to an active understanding when they finally and truly put their own needs first. They finally forget about the timeline and change what it means to Stand. Active Standing can consume a person; we risk letting it define us which can suppress healing. The epiphany is that if you want to keep Standing, you can put your Stand in a box on a shelf where it is safe, but not the focus of your of attention. Surrender is elusive. An Epiphany and Surrender do not mean they will be at that level tomorrow. Is Surrender a permanent state? Perhaps for a rare few, but for most of us it is something we grasp for brief moments. It cannot be a struggle to maintain Surrender because the nature of Surrender is to no longer struggle, but Standing without effort takes a level of acceptance and tranquility that is a narrow path. The Wise-Timers’ challenge is to accept this—which ironically can bring them more moments of Surrender. Look at the image to the right. I did not create this; I found it after I thought I had finished writing this article when I went to search for images to include. It fits what I have been noticing and attempting to describe in our population. 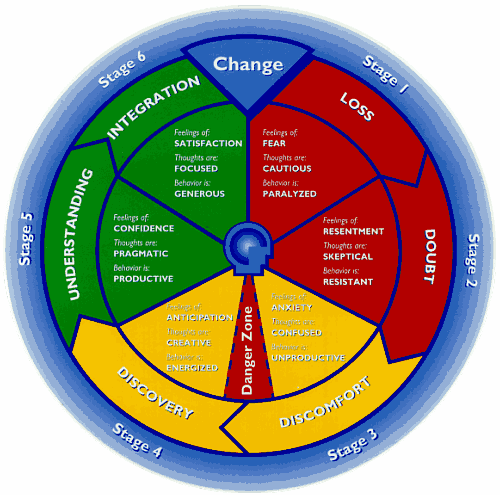 Newbies are in the first 2 stages, Middle-Timers in Stage 2 and 3 and many live in the Danger Zone between Stage 3, Discomfort and Stage 4, Discovery. The Wise-Timers have crossed the Danger Zone and survived and Discovery is leading them to Stages 5 and 6. We all coexist at different places in our journey and thus each of us brings a different tone and influence to the forum. But the mission of the forum remains the same. Your place in your journey and needs are continually undergoing change and the forum is here to support you throughout your journey. This is a very good article, for all. Jennifer recently posted..Reconciliation: If You Stand, Will Your MLCer Return?